"41CE12-186, Burial AH-16" by Timothy K. Perttula and Robert Z. Selden Jr.
DECORATION (INCLUDING MOTIF AND ELEMENTS WHEN APPARENT): The rim panel is defined by single upper and lower horizontal engraved lies. The panel is divided into two sections by opposed vertical curvilinear bracket elements. The sections each have two opposed hooked arm elements composed of three closely-spaced engraved lines; the outermost engraved lines have outward-pointing excised tick marks. Between the hooked arm elements and the brackets are two sets of three closely spaced vertical curvilinear engraved lines; the outermost engraved line has outward-pointing tick marks. The vessel body has horizontal and overlapping brushed marks. Patton Engraved, var. 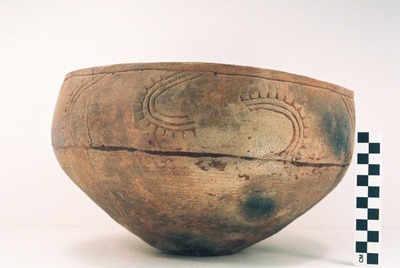 Patton carinated bowl from the Jim P. Allen site.